I have a best friend I connect with every day. I check in with her, and she gives me guidance. I need lots of guidance. OK, it’s not really a “she” but an “it.” It’s my calendar, and I give her/it a lot of attention. How? I give her space. She likes air. She likes not to be crowded. I give her priority. She likes to know that what’s she’s doing is important. Time is precious and should not be wasted. She knows how quickly her pages flip and insists what’s most important must come first. I give her flexibility. She knows that life doesn’t always go how it’s planned. She knows that when she is rigid she will break easily. I give her room to bend. Because I have “formed” first, the “filling” becomes easier. I can say no to evening activities or early morning requests because I’ve already set my priorities. I don’t have much “me” time (except for naps). I don’t do a lot of running around town because I know time is precious. I only get a pedicure once a year, and I can’t tell you the last time I’ve had my nails done. Of course I’m willing to give up these things because I’m so satisfied on what I choose to do. Many people see their calendar as an enemy, and there’s only conflict. I choose to treat my calendar like my best friend, and she is. 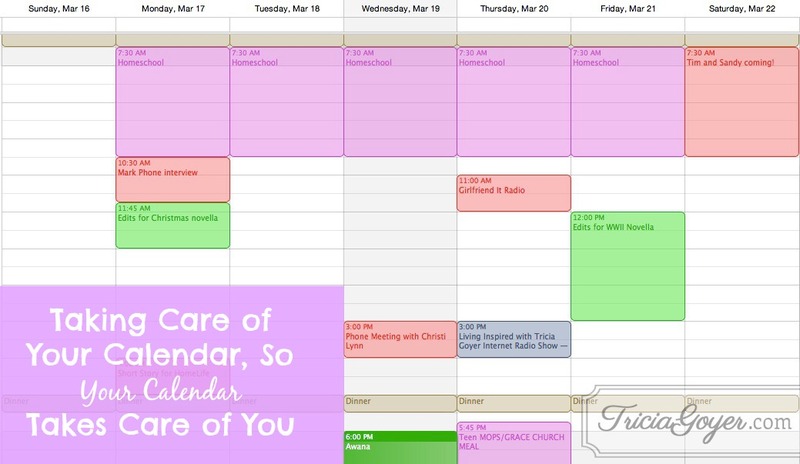 It’s important you see, because when you take care of your calendar, your calendar takes care of you. I’m busy, yes, but I’m at peace. I’ve chosen what I want to fill my life and time with, and I go to sleep at night knowing that I can look forward to the next day because I’ve chosen how to spend it. Dear Lord, thank you for all the opportunities my family and I have to take part in. Please give me clarity as I prioritize and schedule those into my calendar, and help me to leave room for you. Tricia, I just have to let you know how much the Balanced Challenge is helping me out. I have been so productive this week as I’ve written posts every day. I have written at different times of the day than I normally do. It has opened my eyes to pockets of time that I can use to invest in my blog. Also, yesterday’s challenge reminded me of the call God has on my life. Thanks for doing this! Jennifer, that’s awesome!! Thank you for letting me know! It’s been 15 days since I did this piece of the challenge and I find myself right back here. I’ve got too many things on the go and I need to give some of it up. I know what needs to go, but I’m reluctant because I know it will leave the group I’m involved with scrambling. The thing is I haven’t been able to put my all into it for a long time, if ever. It’s hard to let go of something you feel obligated to continue. I am so thankful that I went through this challenge with you. It’s great to be able to come back to it later and try again. I have a feeling I’ll be coming back to different chapters over and over again at different times in my life.